All over the Middle East rises new musical movements channelling the future into the roots of Arabic music. New genres emerge as electronic sounds meet distorted Arabic percussion, uplifting bass mix with hypnotic Debka synthesizers, hard hip hop confronts chopped belly dance samples, high pitched Mawal vocals over rough drum loops. These movements live in the deep dark basements of Beirut and Ramallah, Rabat and Istanbul, and in the Arab diaspora all around Europe, with musicians discovering their homeland culture. A way to (re)discover cultural identity and create new identities, these movements also reflect social change, and the wish of young Arabs to integrate into western traditions and still keep the their unique culture, taking pride in their heritage but also pushing it beyond, into the future. 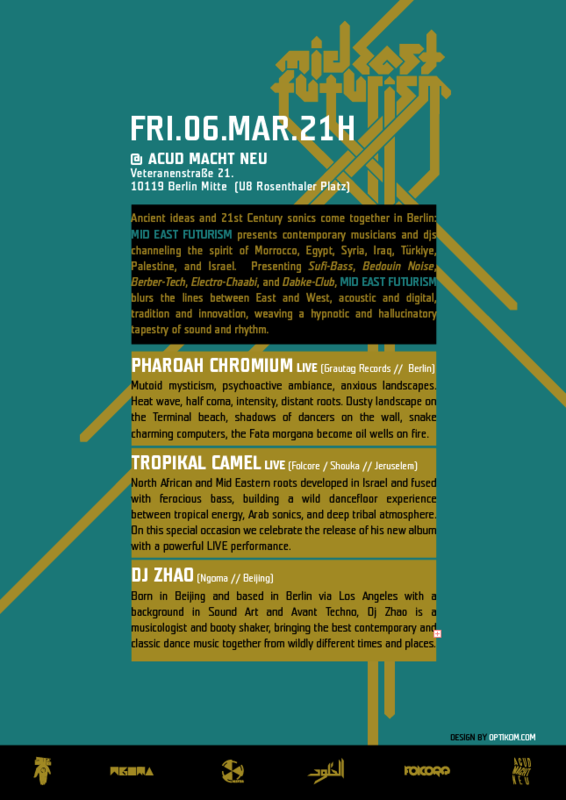 Arabic music is descent of distinct tribal cultures, from the Dvol drums of Kurdistan to the Berber music of Morocco, these forms travel through time and space, into oscillators and drums machines, creating bold new forms today – MIDEAST FUTURISM. Presenting Sufi-Bass, Bedouin Noise, Berber-Tech, Electro-Chaabi, and Dabke-Club, MID EAST FUTURISM blurs the lines between East and West, acoustic and digital, tradition and innovation, weaving a hypnotic and hallucinatory tapestry of sound and rhythm. 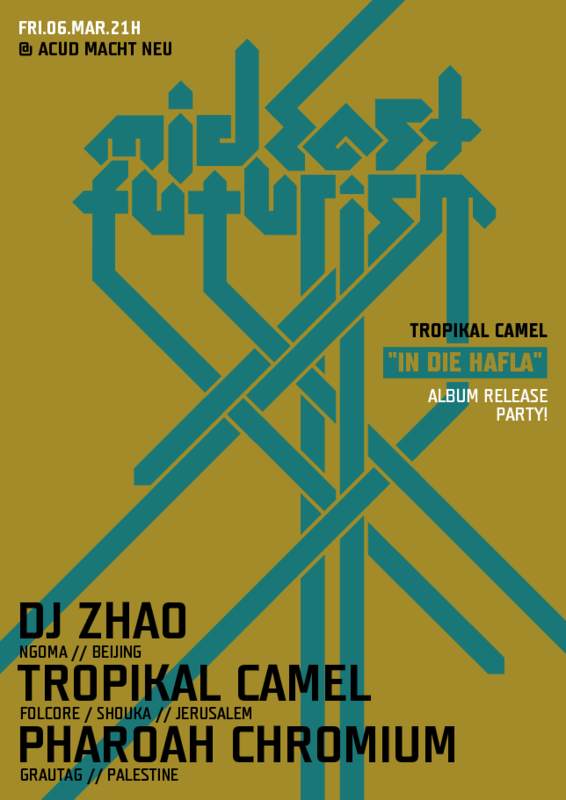 This edition celebrates the first release of Rocky B’s project “The Tropikal Camel” on Folcore Recordings: “in Die Hafla”. This entry was posted in Events, gigs and tagged Arabia, Debke, Electro Chaabi, Middle East, North Africa, Pharoah Chromium, Sufi Bass, Tropikal Camel by ngomasound. Bookmark the permalink.